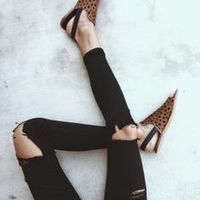 Showing skin through ripped denim has become a fad amongst most women, enough to turn heads, especially when it is a pair of black ripped jeans! Popular when rock and heavy metal was all the rage in the grunge days of the 90s and worn by musicians like Kurt Cobain, ripped jeans have entered the wardrobes of many! 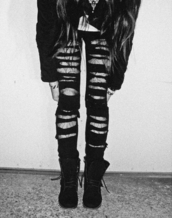 The rips are mostly on the knees and thighs, giving these jeans a cute, yet punk look, to be worn almost anywhere. Team a pair of black ripped jeans with sneakers and a cool t-shirt to get a sporty and casual look or perhaps with a white top and high-heels for a classy look! Whatever top we choose, we know we cannot go wrong with ripped jeans.